The liberty of a democracy is not safe if the people tolerate the growth of private power to the point where it becomes stronger than the democratic state itself. That in its essence is fascism — ownership of government by an individual, by a group or any controlling private power. This great and powerful force—the accumulated wealth of the United States—has taken over all the functions of Government, Congress, the issue of money, and banking and the army and navy in order to have a band of mercenaries to do their bidding and protect their stolen property. The U.S. national debt clock is clicking and it is fast approaching the $12 trillion mark, all the while the Fed (less a central bank than the banks’ Bank) is printing new money like crazy and lending it to its client banks at close to zero interest rates (i.e. at negative interest rates). What is wrong with this picture? It simply means that most Americans are losing big at this game, but a handful of mega-banks and their affiliates are raking in tremendous amounts of money in easily made profits. Indeed, the Federal Reserve’s balance sheet has more than doubled since August 2007, going from $870 billion to more than $2 trillion. It is expected to keep growing as banks avail themselves of the cheap funds the Fed made available to them. The Fed, indeed, has the unique ability to create new dollars (paper currency) for the accounts of assets (good or bad) that it buys from banks, the Treasury, or other entities. This increases the monetary base (the sum of currency plus total banking reserves), and banks through their lending can expand this money supply even further. And the Fed has been extraordinarily generous to the banks, the largest of them are in fact owners of the twelve regional Fed banks. In fact, the Fed has broken practically every central banking rule in order to provide cheap funds to the banks. First, it has pushed the fed funds rate to close to zero so banks could have credit at close to zero cost to them. Second, it has expanded the range and quality of assets it stood ready to accept as collateral for its loans to the banks, so much so that it can be said that the U.S. Fed is presently creating new money backed by the shakiest of assets, some being called “toxic waste.” This is reminiscent of the eighteenth century (beginning in 1789) practice of the French revolutionary government of creating new money (the assignats) backed by the seized properties of the Catholic Church. Let’s summarize quickly the numerous ways the Fed (and to a certain extent, the U.S. Treasury) have found to channel cheap funds to the banks and to brokers. In September 2008, some investment banks, such as Goldman Sachs and J.P. Morgan, officially became commercial banks in order to profit from the Fed’s new generosity. The payment of interest on the banks’ excess reserves at the Fed. The last disposition is worthy of attention. Because of the easy and cheap lending to the banks, the latter piled up tremendous amounts of excess reserves at the Fed, reaching more than $700 billion. Normally, banks would quickly lend these non-interest paying excess reserves to the economy. But, in October 2008, the Fed got imaginative and obtained the authority to pay interest on the banks’ reserves, including excess reserves, at a risk-free rate (the IOER rate). Since then, the banks have been earning interest on their excess reserve holdings, and therefore had little inclination to lend those reserves out to creditworthy but nevertheless risky borrowers in the rest of the economy. With this practice, the circle has been closed, and the Fed was able to provide needed funds to the banks, at close to zero cost, and enable them to rid themselves of their bad investments, without risking creating inflation. That’s quite a banking salvage operation that will be studied by economists in detail in the future. Indeed, it was well understood after the onset of the financial crisis in August 2007, that public capital would be needed to refinance the American banking system. Private capital was too risk adverse to do that. What was less understood was the fact that the Bush administration, and now the Obama administration that continues this policy, intended to provide this capital at close to no cost to the banks and with very scant conditions. But who really paid and has continued to pay for this imaginative recapitalization of American banks, and who profits the most? First of all, of course, bank profits, specially those profits by big international banks, have exploded. Bank stocks have followed suit with tremendous gains. That’s why I say the stock market rally since March 5 (2009) has been a liquidity-driven rally, engineered by the Fed. And it is easy to see why banks raked in so much money: They have been borrowing funds at close to zero cost to themselves and either were paid by the Fed to leave these funds unused or they have used them, with leverage through their hedge fund like activities, to buy interest-paying assets in the U.S. or abroad. In essence, the large “too big to fail” have been allowed to make various trading bets with the cheap public capital provided by the Fed. They gorged themselves with near free public money and used it to enrich themselves, and very little to finance the real economy. One profitable trade, among others, that large international banks and other operators are found to embrace is a form of arbitrage: They borrow and sell the currency of the country that has the lowest possible short-term funding costs and invest the proceeds in countries whose currency and asset markets yield the most. This has the consequence of depreciating further the currency with low interest rates and of appreciating the other currencies. During the 1990s, the Japanese economy was in the doldrums. Its short-term interest rates, just as in the U.S. today, were close to zero. International banks and hedge funds would then borrow yens in Japan, sell them for dollars or euros and invest the proceeds in high-yielding financial assets in the U.S. or in Europe. Provided the interest rate environment does not change suddenly, this sort of “carry trade” is an easy way to make money. The result, however, is a more depressed currency than necessary for the low interest rate country and more imported inflation as the price of imported goods (oil, food, commodities…) increases. The U.S. is presently in that predicament. The U.S. Fed and Treasury have abandoned the U.S. dollar and the large international banks have depressed it further at the same time they fill their coffers. That is why we can say that, besides the profitable carry currency trade that banks and other operators employ to dump the U.S. dollar on foreign exchange markets, this currency will remain under pressure for as long as the spread of short-term interest rates favors other currencies and as long as the spread of expected inflation rates and of expected economic growth remain stable. Paradoxically, longer-term interest rates have only increased marginally. This is because banks and other Fed borrowers, when they do not leave their low interest-paying excess reserves dormant at the Fed, can buy risk-free Treasury bonds. This has the consequence of depressing longer-term interest rates and of boosting stock market prices, even as inflation expectations are on the rise. What is to be understood is that the weak dollar is the direct consequence of the Fed’s extraordinary cheap money policy. To summarize, the average American household is being hit from all sides with this policy. First, if it is a net creditor (as most retirees are), its savings are earning paltry returns (most likely negative after inflation and taxes). Second, the U.S. dollar keeps falling in value, raising the cost of traveling abroad and of everything that is imported. Third, real incomes fall with rising prices as the purchasing power of stable or declining money incomes contracts. Fourth, the exploding public debt will translate sooner or later into higher taxes, thus reducing private disposable incomes. All in all, the standard of living of most people falls. Don’t get me wrong. I do not question the need to inject liquidity into the banking system after the onset of the financial crisis in August 2007. What I question is the way this was done and how the public interest was sacrificed in favor of narrow private interests. Indeed it was done in the worst possible social way, with private gains and social costs. They (the Bush and Obama administrations) recapitalized the banks to the benefit of a small class of bankers, while taxing the entire population in a multitude of ways to finance the public subsidy. There were other ways to attain the same end without taxing the many for the benefit of a few. The U.S. Treasury and the U.S. Fed, both under the Bush administration and the Obama administration discarded these solutions. That’s where the scandal lies. But since it is likely that only a handful of senators and congressmen understand what has happened, I would not be too confident in expecting that there would ever be a public investigation of the scandal, beginning with Congress auditing the Federal Reserve’s subsidized banking loans to large banks and its lack of needed regulatory activities. Kudos, however, to the Manhattan Chief U.S. District Court Judge who has ordered the Fed to make public its lending records. Similarly, at least, some timid steps are being taken in the U.S. and in Europe to impose some limits or restrictions on the discretionary and exorbitant bankers’ bonuses. This comes a bit late, and we shall see if this is merely some political window-dressing to deflect criticism or if it is a structural step to curb oligopolistic and abusive banking practices. Rodrigue Tremblay is professor emeritus of economics at the University of Montreal and author of the book The New American Empire. He can be reached at: rodrigue.tremblay@yahoo.com. Read other articles by Rodrigue, or visit Rodrigue's website. This article was posted on Wednesday, September 23rd, 2009 at 9:01am and is filed under Capitalism, Democracy, Economy/Economics, Neoliberalism. Come on these people only control banks, policy, media, business how hard could it be to start a new way of thinking. A little secret the Earth is already on the job. Strange day’s ahead and it must drive these people of great influence mad well madder than they already were. Black cars, black suits, black hearts. Wow a double post I didn’t do that on purpose but it never hurts to read something twice or more. The solution to this madness is cancellation of debt. Call it the People’s Bailout, a popular revolution against our banking masters. Yes, debt cancellation would be a grand idea, but the parasites won’t let it happen. The Sumerians apparently realised that ‘the magic of compound interest’ meant that debts would inexorably outgrow the capacity to repay them, so they established periodic debt cancellations. The Moslems to this day, and Christians for centuries, outlawed usury, as charging interest on debt is better described. But the rise to global dominance of the insatiably avaricious financial caste, through capitalist expansion, has led to a situation where debt has exploded beyond belief, inequality has grown like topsy and parasite greed has passed all comprehension. Moreover the moneyed classes has used their wealth to buy politics and the politicians in the allegedly ‘democratic’ countries. As well they totally control the mass media, and use it to ruthlessly indoctrinate the proles in apathetic acquiescence and devoted admiration for the parasite class. The process now enters a new phase. The requirement to pay off the gargantuan debt incurred to bail out the bankster crooks will see massive cuts to social welfare and public provision, tax increases for the serfs, and asset-stripping in privatisations, even of supposedly inviolate common wealth like national parks etc. Market capitalism is reaching its inevitable apotheosis-the creation of a global neo-feudalism, where the Masters reside in comfort within their gated communities and gated countries, guarded around the clock, while the masses of serfs descend into squalor and internecine conflict. Meanwhile ecological collapse proceeds, ineluctably. I strongly suspect that the Masters have a plan to control that cataclysm, through brutal Malthusian mechanisms, probably with a technological-scientific input to hasten the process. Organizing around Debt Repudiation is a helleva lot better and sounder than Richard Oxman haphard idea of running a write-in candidate to for the California governorship (TOSCA). Isn’t it interesting how the Left was all out for third world debt cancellation but nary a peep from the Left regarding canceling the debt of U.S. citizens who are now seeing their living standard diminished and are being made homeless. The Left needs to start to think big. Here is a discussion about the Left with Alexander Cockburn and David Harvey. Ahmadinejad’s talk at the UN. Shame on zionism and its puppets around the western capitals. 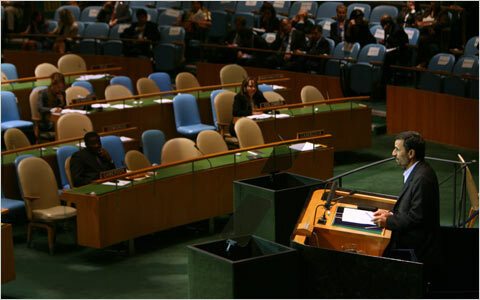 Shabnam – Separately from you I had just come across this article with the photograph of Ahmadinejad speaking to rows to empty chairs. As you say shame on the Zionists. Hearing the truth is painful for them. The execrable John Bolton is obviously alive and well in the boiler rooms of the UN building or wherever he lurks. Mr. Ahmadinejad had his own harsh words for both the United States and Israel, charging that the invasion of Afghanistan has failed to eliminate, and even exacerbated, problems with terrorism and drug trafficking. He pointed to America’s failure to close the detention center at Guantanamo Bay Naval Base in Cuba and alleged that secret prisons remain open in Europe. Mr. Ahmadinejad called Israel’s attack on Gaza in November (sic) “barbaric” and said the economic blockade of Palestinians amounts to “genocide.” The critique led delegations from Argentina, Australia, Britain, Costa Rica, Denmark, France Germany, Hungary, Italy, New Zealand and the United States to leave the room, as the Agence-France Press noted, citing European sources. Mebosa – What have I said that is not true? Do you have any evidence that what I write here is not true? I think you find the truth a bit overwhelming. mary, I know execrable is apt, but I prefer excremental.